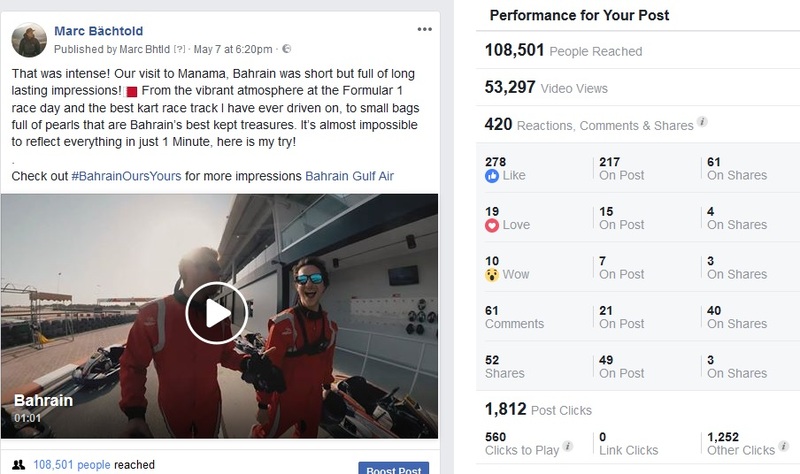 Visit Bahrain brought me to Manama, the capital of the Kingdom of Bahrain, to capture the vibe of the city during the F1 Grand Prix in a one Minute Video. With the the correct use Facebook Ads we could reach over 200.000 People from the right target group – even with a tight budget. I didn’t have much time to create all the necessary footage. The weather was not ideal and access on the circuit was limited. So it was a constant shoot and run, not much rest in between but the impressions were incredible! The goal was to get enough footage for an one minute social media teaser and some stills to post on VISIT BAHRAIN’s social media channels. The audience doesen’t always have to match the one I can provide through my channels. In this case ad campaigns on social media can be a strong weapon of choice! The client’s budget for Facebook Marketing was tight. In fact, there was nothing planned to invest for Facebook Marketing which is why I could only spend 50 EUR on a carefully selected audience. In the end, I could achieve a CPR of €0.002 and reach over 200.000 people on Facebook and Instagram with that small budget. The video was created until 2 weeks after the trip. It features 360 degree footage from a GoPro Fusion camera that gains additional reach on other networks. Do you have questions related to Content Creation and marketing for your resort/ destination or company? Maybe you already have an idea or a specific project in mind. Please, feel free to send me message with all the details and I will be happy to assist you.